Leinster are not just the best team in Europe right now but they have proven time and again this season that they are also the smartest. There may not have been a vast disparity between the winners and the losers yesterday in terms of overall ability or physicality - albeit the levels of intensity deviated as it must in this most brutally demanding of sports - but when it came to making the right decisions at the right time, Leinster were simply in a league of their own. So soon after Twickenham, it was a startlingly similar representation of the current chasm that exists between the Irish and English game. If one were colour-blind, it would have been difficult to assess how Ireland's approach to the game vastly differed to that of Leinster; for obvious reasons, as the majority of the Grand Slam winners reside in the east. Remarkably, it seems that the youngest and least experienced players are those more easily capable of managing the transition from the international camp to the provincial. Then again, youth has a sponge-like ability to absorb almost infinite reams of knowledge. James Ryan and Dan Leavy spearheaded yesterday's de-throning; championship teams require championship moments and this duo delivered on and off the ball. Their defiance screamed not merely physicality and passion but poise, too. Before half-time, Saracens strode confidently towards the corner to assume the position for a five-metre catch and drive; seconds later, Ryan had soared to steal from Nick Isiekwe. The whistle blows; Leinster race to the sheds; Sarries trudge. "That steal was a huge moment," admits Leavy. And then Leinster explode in the defining third quarter. Now winning collisions and gain-line, the visitors are further disrupted by relentless Leinster carrying and suddenly, an unguarded ruck allows Ryan and Leavy to exchange passes, smuggling the latter through a yawning gap. "It was kind of a spur of the moment thing," says Leavy; most championship moments are. "I just popped it up to and called for it back and the defender committed so it was a free run in. "And then I did a somersault and nearly knocked Rory O'Loughlin out with my foot! I need to work on that." Six minutes into the second-half, at 21-12, Leinster were in complete in control; moments earlier, they could - perhaps should - have trailed by four or six points. The veteran captain Isa Nacewa reflected admiringly on the astonishing influence wrought by these - and other - young tyros beneath his wing. "You have to give credit not just to the physical efforts that these guys thrive at but also the amount of work that they do off the field," says the Leinster captain. "Even guys coming back from Irish camp, and being around Joe Schmidt. They come back with another level of game knowledge. "Leo Cullen and Stuart Lancaster are big on driving how much work you do off the field as much as on it. "These guys are putting as much craft into their game as graft, and it shows up in the level that they play the game at. "It's the decisions they make under pressure. Not just the general knowledge of the game. They make them when the pressure is on which is the important step for them as they develop." 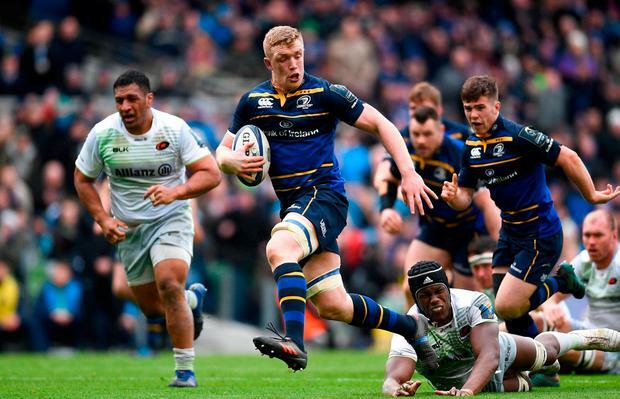 Leinster struggled at the business end last term for precisely these reasons; for all their wondrous football, they lacked composure when it was needed. "We talk about big moments a lot. Stu and Leo would drive a lot of game understanding from the shot callers. "Even the way Joey Carbery and Nick McCarthy come on to control the last ten minutes. So we would put a lot of emphasis on that. "Look at guys like James Tracy, Leavy, Ryan in particular. They took on those lessons and ended up winning a Grand Slam. "They come back here to Leinster and the hunger is huge. We learned from being in those places where we fell down last year. But we get up and we go again. "That has been etched in the back of our head. It is something we don't like feeling. We have talked about it a lot and learned from it. "We took a big step tonight to earn another 80 minutes of footie. It's knockout rugby. There is no room for mistakes."